Continuing a previous discussion below on whether Simon is indeed descended from Valentin (indicating Simon and Jacob are brothers), and although this appears to be generally accepted by Skroch genealogists, I have not seen anything to prove this. Going through the photos and documents that my aunt Betty sent me recently, I came across the attached chart which seems to indicate otherwise. The chart indicates Simon Skroch was born in 1802/03 and that his father was Gregor Skroch (born March 10, 1759) and mother was Susanna Fiecek (born June 18, 1769). I recognize that this chart of itself does not constitute any kind of "proof," but given the specificity of the dates shown, I think whoever prepared it must have had some source documents as its basis. 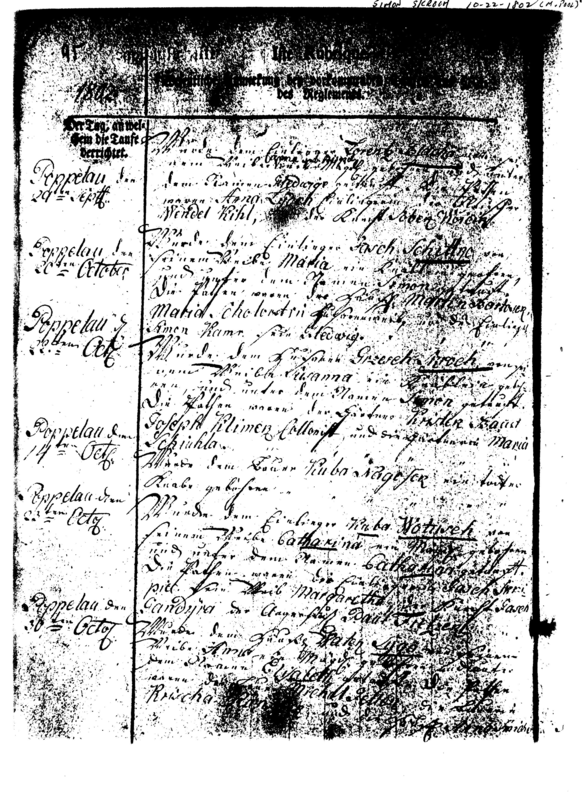 I do however question the entry for Gregor's father "Jacob Skroch 1706" as Jacob would have been 53 years old when Gregor was born - possible, but somewhat unlikely scenario. Seems to me there is a generation missing in there. The other intriguing thing here is that some of this information is very close to the lineage of our cousin Thomas Bauch-Mertens. So what do you think, Thomas? I would be very interested in your opinion of this chart and any additional information you might have. My hunch is that those of us on the Simon line and those on the Jacob line are connected at some point, but it may be farther back. Now wouldn't that be exciting to then find where these two lines are then connected to Thomas's? I'm hoping as I go through the early church records, that I will find something to substantiate or disprove this. Wurde dem Husaren Grzesch Skroch von seinem Weibe Susanna ein Knäblein geboren und unter dem Namen Simon getauft. Die Pathen waren der Gärtner Kristek Baucz ?, Joseph Klimek Collonist und die Gärtnerin Maria Schichla ? Husar == military rank "Hussar"
This record seems out of place and does not match Martin Pool's history. Dates of birth are same as Christina but marriage records are different Needs more investigation. Married: Christek Prokot on 11 Aug 1863 in Schalkowitz, Opole, Poland. Christina Skroch b.1-20-1843 prob. 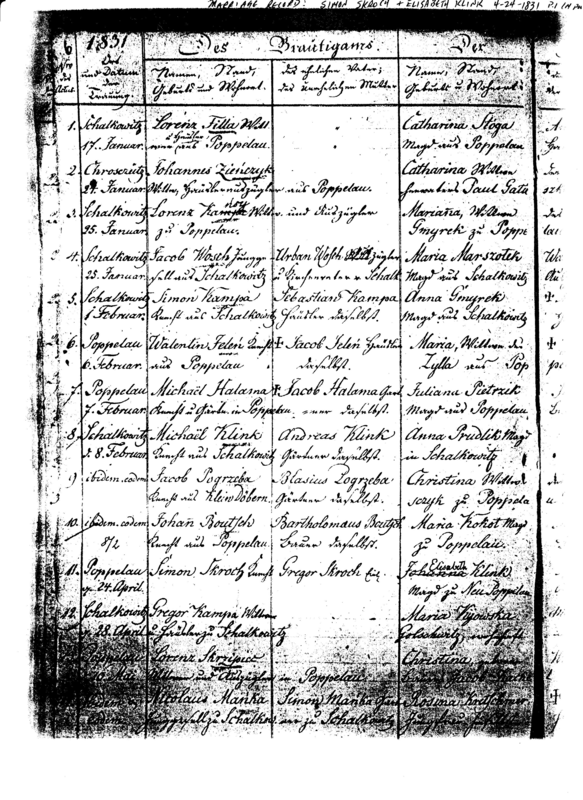 in Poppelau, Opole, Poland m.11-13-1860 in Poppelau, Opole, Poland (dual marriage with Casper Skroch and Hedwig Nogosek) d.12-24-1913 in Kensal, ND (arrived 4-29-1872 New York aboard ship "City of London"
Married: Gregor Nogosek on 13 Nov 1860 in Poppelau, Kreise, Oppeln, Germany. This wedding occured together with the wedding of Casper Skroch and Hedwig Nogosek, daughter of Andreas Nogoseck. Gregor Nogosek b.11-17-1839 in Poppelau, Opole, Poland m.11-13-1860 in Poppelau, Opole, Poland d.9-26-1902 in Spiritwood Lake, Stutsman Co., ND (arrived 4-29-1872 New York aboard ship "City of London"
Gregor was born 17 Nov 1839 in Poppelau, DOD: 26 Sep 1902. His parents were Thomas Nogosek and Elisabeth Jochem. Christina died on 24 Dec 1913 in Kensal, Stutsman Co., ND. She was buried on 29 Dec 1913 at Sacred Heart Cemetary, Fried, ND.